Even if J.D Salinger had kept publishing work until his death in 2010 there’s no way he would have touched blogging with a 1000-foot pole. Why? Because J.D Salinger was the kind of writer who liked to keep his finished manuscripts locked in a safe where no one could find them until after he died. J.D. Salinger didn’t care if people read what he wrote; he didn’t care if his writing was relevant to his audience’s needs, or if it solved their problems; he didn’t want you to easily find what he’d written. For all these reasons J.D. 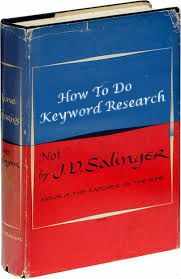 Salinger does not need keyword research. J.D. Salinger could pull ideas from the sky and write about whatever he wanted because he wrote for himself and his safe and the wants and wishes of his reader didn’t affect his bottom line (which I can only assume was finishing novels and locking them in safes). Now, you on the other hand. If you’re reading this blog you probably do care whether people read your content. You understand that creating content no one reads is a drag. And, actually, aside from plain hurting your soul, you understand that content that goes unread is also a huge waste of time and money. You are a marketer or other online peddler of products, education, and information and you care whether people read your content, so you (should) also care about search engine optimization, content marketing, and whether the content you write solves problems, entertains, or is otherwise relevant and click-worthy in the eyes of your target market. You can’t afford to pull ideas from the sky because your bottom line — the accrual of traffic, leads, conversions, and other KPIs — depends on your content getting read, shared and ranked, and concepts pulled from the sky don’t always succeed like we think they will in our heads. Nobody (except J.D. Salinger) sets out to make a product that no one will ever want to buy, so why (unless you are J.D. Salinger) would you set out to write content no one will ever want to read? You wouldn’t. And this is why keyword research is important, even in a concepts not keywords era of search marketing. 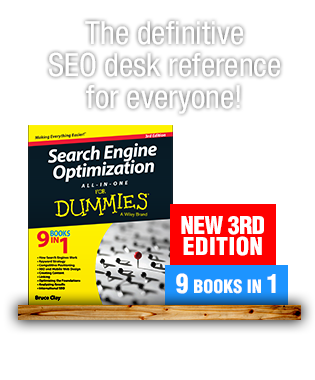 By giving you pre-click information about the questions people are asking and the information they are seeking, keyword research effectively tells you what people want to read based on the actual questions they ask. 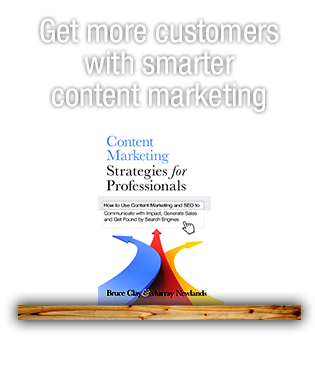 It also tells you how many people are interested in reading about specific topics which puts you in a great position to prioritize your content creation based on demand and potential reach. For content creators looking to create relevant content that gets in front of the right audience at the right time the information yielding from keyword research should be considered pure marketing-strategy gold. As you’ve probably noticed, today SEO is all about strings not things, concepts not keywords, ideas not exact-match phrases. Today Google can put two and two together and return a blog titled “The Future of Content Marketing: Trends and Predictions for 2014” in page one results for the query “how to do content marketing” even though the exact keyword phrase is not in the blog’s Meta title or description. It’s pretty remarkable; Google is starting to understand the implications of words, and that humans typing a question into search boxes want the results returned to be answers, not their questions repeated back at them. Page one results for the query “how to do content marketing.” Notice exact phrase optimization isn’t a factor, but relevance and optimization for click-through is. 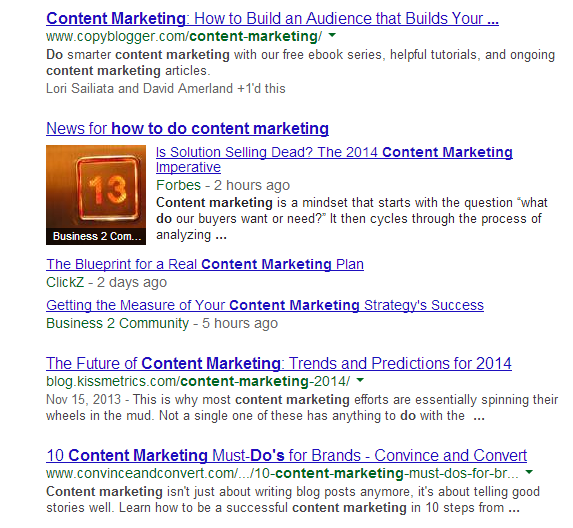 In 2014 search spiders require less hand-holding to understand what content is about, which largely means we — content marketing peddlers — must evolve our focus from plug-and-play exact-match phrase placement to the craft of content that is truly intended to resonate with a human audience. To some this freedom from exact-match shackles may seem like a reason to strike keyword research from the online marketing to-do list. I’d argue the exact opposite, though. A freedom to use more natural language that resonates with humans, means we’re also taxed with a heightened urgency to understand the needs of our searcher more specifically, and, in turn, how we can respond to that need in the right way. I’d argue that in an era of SEO where a focus on context, connotation, SERP interaction and human need are more important than ever, keyword research — a tool that gives us direct data-backed information about human need — should also be considered more important than ever. Unless your plan is to lock your content in a safe for 50 years J.D. Salinger-style. If that’s the case, yeah. Don’t waste your time. 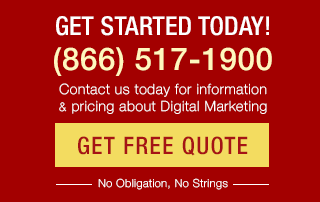 What role is keyword strategy playing in your online marketing mix this year?